Being invited for guest-meddling, I decided to look into the MBS deck that seems most appealing to me: Doom Inevitable. Although I’d rather get my after work drink with the Mirrans than the Phyrexians, the subtlety and wit with which they are pursuing their goals – though we already know the outcome – hint at a long-term master plan that needs to be admired. 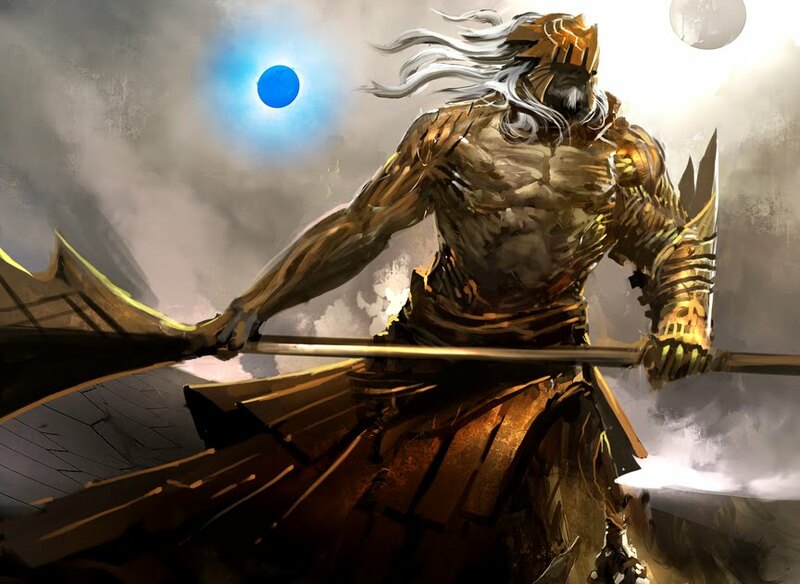 Today begins our next round of Ertai’s Meddlings for the Mirrodin Besieged intro decks. For those recently joining us, the Meddlings are one of our most popular features, where we take an intro deck and tighten it up. As the game’s developers have acknowledged, intro decks include a number of suboptimal choices to help guide new players along the path to deckbuilding. In that vein, then, Meddlings are signposts along the way- a possible outcome if you take out the bad cards and fill it with ones that reinforce the deck’s underlying theme and strategy. The idea here is to let folks build with cards they might already have laying about, rather than having to go out and buy a bunch more. There’s also the added challenge of ‘doing more with less.’ As Mark Rosewater so often says, restrictions breed creativity. That being the case, the object of our creativity today is Path of Blight, the successor to Phyrexian Poison and the set’s infect-based offering. Unlike Poison, Path drops the Black component and picks up White, reflective of the growing corruption of the Phyrexians on Mirrodin. For us, this makes our job a little more difficult, as Black is loaded with quality infect cards but White has precious few. Let’s see what we can come up with, and we’ll begin by reviewing the strengths and weaknesses of the deck we identified in our initial review. Eager to tear into the brand-shiny-new Event Decks released for Mirrodin Besieged, Jimi and I broke them open, sleeved them up, and laid out the playmats- time for battle! We had one guideline we established straightaway, and that was that we would not be sideboarding between matches. 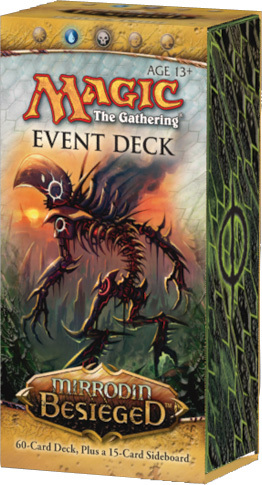 As preconstructed decks don’t ordinarily include them, and they’re more a fixture of Constructed strategy, we wanted to battle the two decks against one another as we would with any precon- stock right out of the box. Here are the notes from the confrontation. Warning: it ain’t pretty. 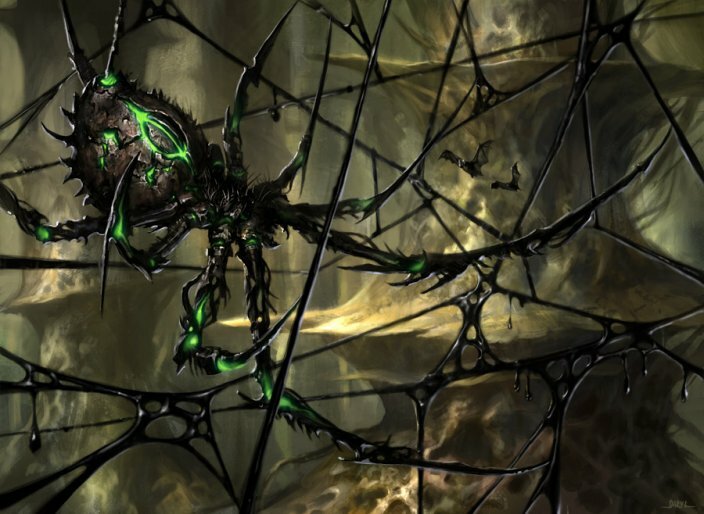 Again as we prepare to explore the second of the two Event Decks, the Phyrexians’ Infect & Defile, we must answer the question of how to build a successfully competitive deck within the confines of the card pool allowed. Most decks at the competitive level lean on mythics and a solid number of rares. How can decks permitted zero mythics and only seven rares hope to hold its own? Into the Breach found one niche where a narrowly-focused deck could make a decent showing of itself: mono-Red aggro. 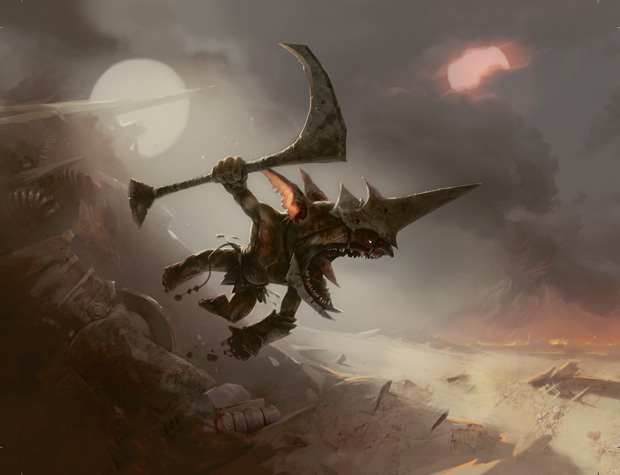 Leaning on cards like Goblin Guide, Goblin Bushwhacker, and Lightning Bolt, it traded power for blistering speed, and will certainly steal a few wins on that account. That takes care of the Mirrans, but what about the Phyrexians? As it happens, the answer lies within the question. It’s in niche specialisation, of course, and with infect being around for all of two sets, it doesn’t get much more niche than that. Infect & Defile takes a very intriguing and unconventional approach to the strategy, however, in that it doesn’t pack a swarm of infect creatures- in fact, it’s relatively creature-light. Instead, it plays more like an aggro-control deck, looking to resolve a few threats then back it up with denial and removal. It’s an approach well worth a look, and we’ll start with those sixteen beaters. The waiting and anticipation is finally over. 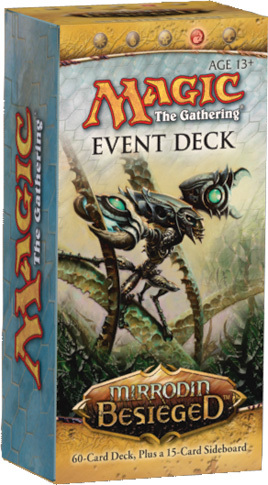 It isn’t often that Wizards releases a new line of products for Magic, but the much-anticipated Event Decks can now take their place alongside the Duel Decks, Premium Deck Series, Intro Packs, and other such preconstructed products. And the verdict? Well, taking a stab we’d say they’re not as good as what some folks hoped, but far better than what many feared. When news of the Event Decks was loosed into the community some months ago, speculation was rampant as to what they might contain. 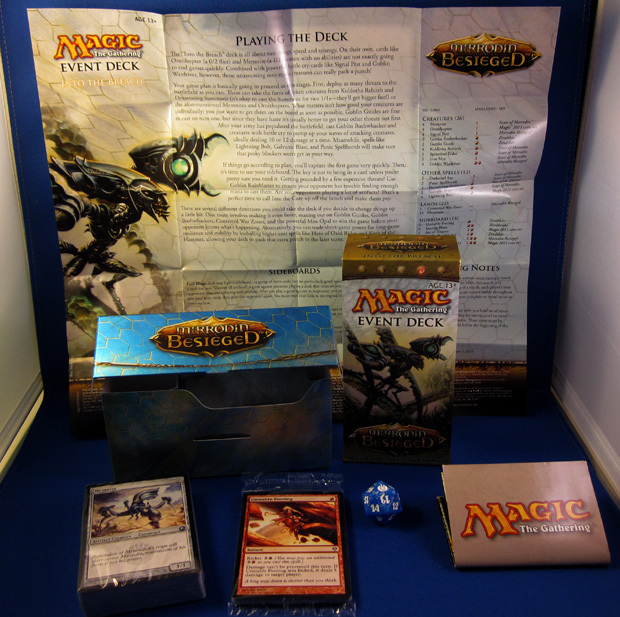 The decks were positioned as “FNM-ready,” perhaps not a deck you could win a PTQ with but certainly one that would give you a shot at your local comic or hobby store. That deliberately-vague depiction left tremendous ground for guesswork. Would they have a slew of rares? Mythics? Planeswalkers? Jaces? For those entertaining the end-spectrum of such fervent hope, prepare to be disappointed. The Event Decks- and there are two for Mirrodin Besieged (and two for the next set, ‘Action’)- contain exactly zero mythics. Nope, not a planeswalker between them. What you do get, though, is a finely-tuned deck that includes seven rares and a host of uncommons, so you certainly get some card value right off the top. In addition, each is packed in an attractive cardboard box, including a divider (for your deck versus your sideboard) and a Mirrodin Besieged “spindown” life counter. Nice attention to detail: the deck box holds the deck perfectly when they’re sleeved. The real question, however, isn’t so much content as positioning. Do they live up to the hype? 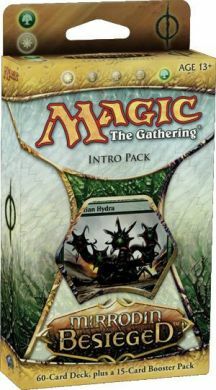 The card list is static- you know what you’re going to get when you crack one open- but the Friday Night Magic scene is anything but. Some are very casual, some very competitive, and the majority likely a proper mix. I’ve gone from battling against someone’s Orzhov-themed lifedrainer deck in one matchup right to the guy with playsets of Jaces and Baneslayers (back when she was a hotter commodity). You’ll find folks playing “netdecks of the stars” to those with a modified intro pack. It’s a meta that, from where Wizards is sitting, is virtually impossible to plan for. So how then do you construct these decks? Coming full circle, we sat down tonight to put Path of Blight to the test against the deck that we kicked off the set’s reviews with, Mirromancy. 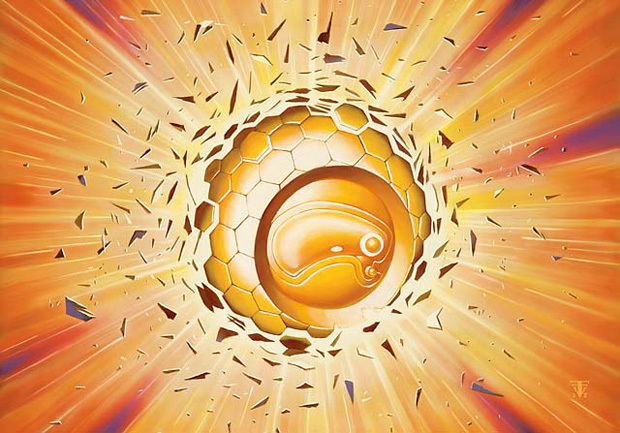 While the end of the cycle, this was also something of a foreshadowing, as the mothership officially announced the decklists of the upcoming Event Decks today, one of which is an infect build. We’d be back with the poison counters before long, but this was a great chance to see how the set’s progressed since Scars of Mirrodin’s Phyrexian Poison’s overcosted weenie swarm. Jimi opted to squeeze in behind Mirromancy, the spell-heavy Blue-Red Mirran deck, and here are our notes from the three matches. As we begin our final review of Mirrodin Besieged, we have the table farily well set for the ongoing conflict. On the one hand, we have the Mirrans fighting for their very existence using every tool at their disposal. Be it through battle cry and metalcraft (Battle Cries), or heavy-hitting magic (Mirromancy), the line in the sand has clearly been drawn. Staring back from the other side are the Phyrexians, who have brought living weapons and proliferation to bear (Doom Inevitable). But of course, no accounting of the Phyrexians would be comlete without their signature mechanic for the set: infect. 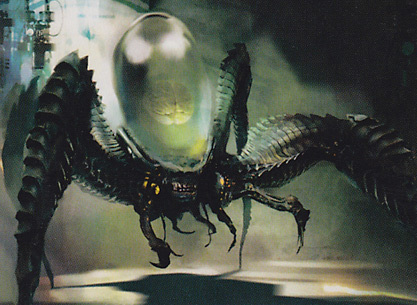 Infect has proven to be quite a volatile addition to Magic’s keyword litany, as it tends to be somewhat polarising in a love-it-or-hate-it kind of way. Some revel in the flavour and the novel challenge of poisoning their opponents to death, a win condition far more feasible now than at any point in the game’s past. Others, however, see it as format-warping, particularly in those with altered life totals such as Commander and Two-Headed Giant. Let’s not even get started on the flap surrounding the Blightsteel Colossus! But like it or not, it’s here to stay, and Path of Blight proudly marches underneath its banner. 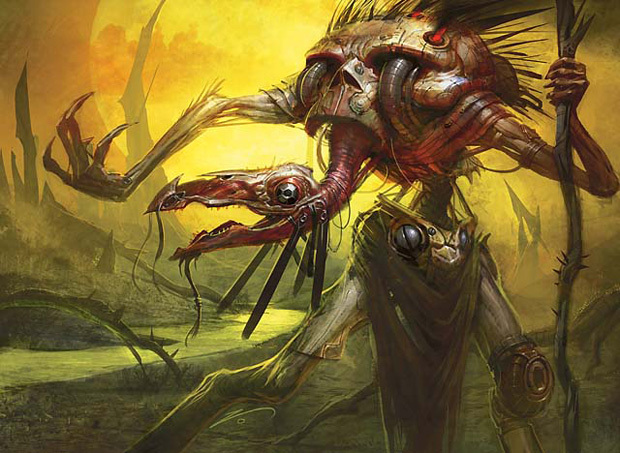 If there’s a subtheme to be had in the deck, it’s the seeping corruption that is Phyrexia. Infect was exclusively Black and Green for Scars of Mirrodin, but now having festered right under the noses of the Mirrans, it’s crept into everything. The idea of a Selesnyan-coloured infect deck would have been mindblowing just a few months ago, but here we see the evolution of the block. Gone is the overcosted weenie swarm, and here is something that has… adapted. Here are the notes from the match, and perhaps you’ll see what I mean. With subtlety and subterfuge cast aside, the forces of Mirrodin are now engaged in open warfare with the Phyrexian infestation that had festered unseen in its core. And while the Phyrexians have genetically engineered living germs to animate their gruesome artifact weaponry, the Mirrans have found the power to inspire and rally their forces on the battlefield. To defend their homes, their lives, and indeed their very existence, they harness the power of the battle cry, as represented in the second Mirran intro deck, the imaginitively-named Battle Cries. Unlike Mirromancy, Battle Cries is cut from a far more traditional mold with regards to its composition, boasting a 23/13 split in favour of creatures. When you factor in that nearly half of the noncreature spells are actually alternate ways to summon creatures, the picture that emerges is very clear. This is a deck that wants to hit in the red zone, and hit hard. The battle cry mechanic has been engineered to enable this. Quite simply, whenever a creature with the keyword attacks, all its fellows who are attacking alongside get +1/+0 until the end of turn. Multiple instances of battle cry do stack, so it doesn’t take much to get a powerful strike out of even the smallest of creatures. Today we’ll be examining this mechanic, and seeing how the deck has been built to support it.